You've been invited to a social gathering, and your mind is racing. Part of you wants to go, to laugh with friends, and enjoy marvelous food and wine. But there’s another part of you that wants to hide. How can you possibly survive hours among a large group of people, maintain witty conversation, and manage not to trip/fall/offend anyone/spill drinks on strangers? More than anything, you're wondering how you can be more outgoing so that you'll fit in better. If you feel shy, socially anxious, or otherwise awkward in group interactions, you aren’t alone. It's possible to overcome that awkwardness and find your inner social butterfly, so that you can get through the door and stay away from the safety of the food table at the next social occasion you attend. One of the first things to acknowledge in social situations is also one of the least obvious: almost no one is a natural at them. 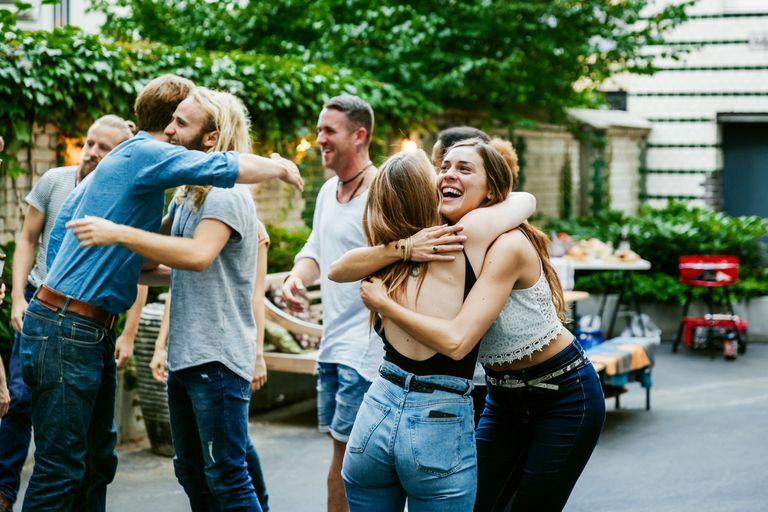 Even the most extroverted, outgoing person at the party feels a twinge of anxiety walking through the door, mingling in the crowd, and dancing on the makeshift dance floor. Most people don’t talk about those moments, but they exist nearly universally. So, to feel more settled when entering a gathering, sometimes you have to see your panic in everyone else, too. When you realize how focused everyone else is on keeping themselves from looking foolish or otherwise exposing their awkwardness, you have the chance to settle your own mind and concentrate on helping alleviate their anxieties instead. Not only that—did you know that most people can't tell when you are anxious? Even though you might experience what is known as the "spotlight effect" (it seems like all eyes are on you, and everyone can see your anxiety and awkwardness), truthfully most of what you are experiencing is hidden. To the outside world you may appear cool and calm, which makes it easy to put on whatever persona you choose. It really is all up to you. If you don’t feel the least bit outgoing, you still can pretend you do. Make a game out of matching the energy of each person you meet. That way, high-energy, outgoing people naturally coach you through your own discomfort because they offer you a prototype to mimic. Plus, many outgoing people enjoy fellow outgoing companions. Once you establish a brief connection with an outgoing person, you can relax and allow that person to take the lead in future conversations. One more tip—try to make eye contact no matter how much it pains you. Not looking your conversation partner in the eye, or for that matter, anyone in the room in the eye, is bound to create a wall between you and other party-goers. People want to feel as though you are interested and engaged when you talk, and eye contact is one of the easiest ways to convey that. Most people (socially anxious excluded) love to talk about themselves. If you find yourself feeling awkward or anxious, turn your full attention to learning as much as you can about someone else in the room. This doesn’t mean turning a party into an inquisition. But, in small doses, turning a conversation back to your companion is an easy way to ease your own uneasiness. Learning about other people at a social gathering also puts you in a unique position as a networker. Your attention to the likes, concerns, work, and hobbies of others sets you up to link people throughout the course of the evening. Everyone involved feels validated, and they perceive you as a valuable resource as well as a good conversationalist. Not all parties are worth suffering through until the bitter end. If you are extremely anxious about attending a function, give yourself permission to try to attend it for a set amount of time or until you have interacted with a given number of people. Until you reach that milestone, commit wholeheartedly to enjoying yourself as best you can. Sometimes, you may find yourself exceeding your maximum time without realizing it. When you do, decide whether you have the energy to keep going. There is no wrong answer; honor how you feel, and be kind to yourself regardless of what you resolve to do next. Not everyone is meant to be outgoing, and that’s OK. Do the best you can, and be proud of yourself for trying. If you find that despite your best intentions, every social situation turns into your worst nightmare, it might be helpful to speak to your doctor or a mental health professional to assess the symptoms you are experiencing. Even severe social anxiety is a treatable illness that can be helped through the right combination of therapy and medication. Howell AN, Zibulsky DA, Srivastav A, Weeks JW. Relations among social anxiety, eye contact avoidance, state anxiety, and perception of interaction performance during a live conversation. Cogn Behav Ther. 2016;45(2):111–22. Brown MA, Stopa L. The spotlight effect and the illusion of transparency in social anxiety. J Anxiety Disord. 2007;21(6):804–19.